A long, long time ago, Democrats had a lot of fun with signs. They posted them everywhere — on drinking fountains, in restaurants, in clothing stores, you name it. There was a sign for every scenario for telling people with dark skin color what to do and where to go. These Democrats, like Bull Connor, just loved their signs. Those signs made sure that "colored" people knew their place — which was far away from the white Democrats who hated them. Those same Democrats turned fire hoses and dogs on the black Republicans (like Martin Luther King Jr.) who dared confront them on their bigotry and hatred. Those black Republicans marched with white Christian abolitionists (also Republicans) to end the evil scourge of racism in this nation. Yet, over time, the Democrats have successfully whitewashed their involvement with their deeply racist past. They managed to blame it on Republicans (as usual) and Republicans haven't been smart enough to fight the myth, even though the majority of the opposition to the Civil Rights Act of 1964 was overwhelmingly Democrat. But that's old news. What are the Democrats up to today? They're going back to their roots and have gotten back into the sign-posting business again. They're putting up signs in every cafe in the land to let us Deplorables know we can't sit with them. They're trying to be sneakier about it this time. The signs don't say "TRUMP SUPPORTERS GO AROUND BACK" or "DEMOCRATS ONLY." Oh no! That would be too obvious. Instead, they're posting these. 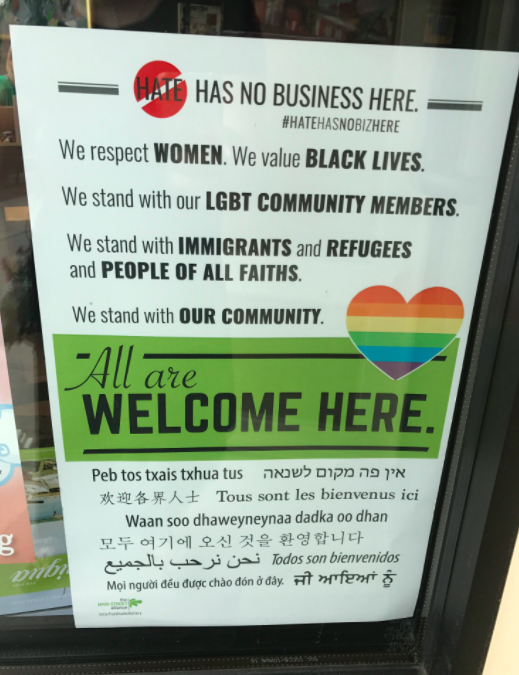 These signs are to let you know, you hateful lover of law and order and restraint and decorum, that you are not welcome here. Contrary to "all are welcome," you will notice that one group is decidedly missing. You. You think abortion is murder, so you don't "stand with women," even though half of those babies being killed are girls. You favor legal immigration, so you don't "stand with immigrants," which means allowing anyone including ISIS to just sally over the border willy-nilly as they please. You believe in traditional marriage and that children should not be denied a mother and father and so you do not "stand with the LGBTQWTF" crowd, even if you have no ill will toward them. Just the fact that you believe children have a right to their biological parents makes you a "hater." You believe in biology and know that chromosomes don't change because you want them to.This makes you "anti-science."